We provide unique designs so our packaging designs are not just what it looks and feels like. But our design is how it works to promote your brand. So our packaging helps you to promote your chocolate product. Our conceptual design and implementation call every people so you gain your market position. 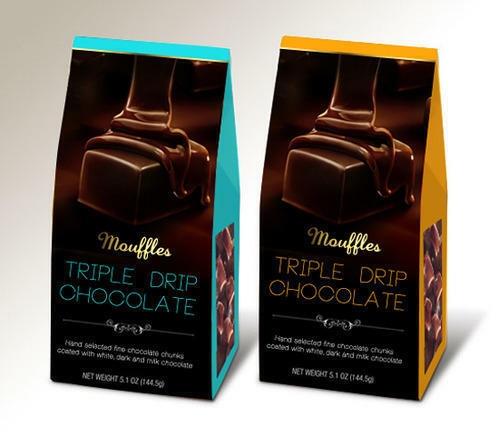 We provide Cold Seal Packaging, Rotary Packaging,and the Printed Film Rolls.We provide high quality protective material for wrapping the chocolate. Like every chocolate you will find here unique Packaging designs which allows easy variations without losing visual appeal... Our packaging must protect the Chocolate against all adverse external influences. So its aroma and freshness will remain same until it use. Our Packaging is available in different sizes, Shapes, and colors with company name and logo. On the back of our packaging, we also provide list of ingredients so you can easily read about the ingredients so that everyone understand how your product. So visit Swisspac.de and request SAMPLE PACKS- it's easy and free. Packaging Details Our minimum quantity for Stock pouches is 1000 pieces. Our minimum quantity for Custom printed design is 10000 pieces. We are a leading manufacturer in the flexible packaging industry. Offering a wide variety of high-quality stock and custom made products for a wide range of industries. With more than 30 years of experience we specialize in manufacturing stand up pouches, block bottomed bags, side gusset bags, shrink sleeves, liquid bags, degassing valves, measurement scoops, zipper and more. We have quickly advanced and become the world leader for stand up pouches with an unrivalled variety of products. Our company is well placed and we are able to provide worldwide coverage and support to our customer regardless of their size. Our main goal is to become your Flexible Packaging Partner. Significant point :Understanding customers’ requirement. Converting it in satisfactory product. Our minimum quantity for Stock pouches is 1000 pieces. Our minimum quantity for Custom printed design is 10000 pieces.